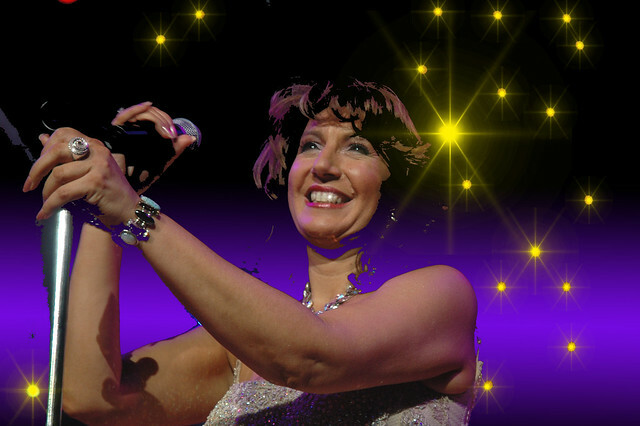 What better way to present Cruise 2011, than worn by the sensational Jane McDonald. Mistress of the sequin and breathy renditions, over a Bontempi backing track; of Peggy Lee's Fever... Miss McDonald has delighted us since her BBC 'Cruise' days through her move over to ITV's panel of HRT-D-to-the-eyeballs Loose Women, to her inevitable return to the cruise ship. Well on her 2011 tour of the Caribbean she's going to need a fabulous wardrobe, and the Cruise collections featured lots of lovely trouser suits Jane would look bloody smashing in. To start the day on board, a Christopher Kane smart-casual Lounge Suit all-in-one will do the trick. The nice wide leg will provide ample swishing opportunity whilst one navigates the promenade, bucks fizz in hand. The razzle dazzle solar system print allows a nice segue to the Piano Bar, where Jane has been badgered into an impromptu jazzed up version of "fly me to the moon." Impromptu my bum: mid key change Jane whips the one-sy off to reveal a leggy (and props to her - extremely fashion forward) silk t-shirt/ra-ra skirt in matching print. Another Christopher Kane ensemble (Jane and his mum are like this.) She concludes a 45 minute set of jazz standards with her inimitable cover of Carol Douglas' 'Doctors Orders' and a high leg kick, revealing not only miles of shiny sheer tan coloured tight, but a black marabou fluffy mule, again courtesy of that lovely lad Christopher. After a trip back to her suite to freshen up and apply an extra layer of bronze eyeshadow, it's cocktail hour and at the Captain's request, Jane will be joining him and his wife at the helm for Harvey Wallbangers. Enter Jane: shocking red Givenchy trouser suit with matching red turtleneck. So chic! (although she doesn't go with the official serving suggestion of a strappy-peep-toe gladiator thingy, opting instead for a glossy white PVC stiletto ankle boot, with extra pointy toe. £13 at Dorothy Perkins back in Doncaster. You can't argue with a bargain like that.) After three Wallbangers Jane has kicked off her boots and is sashaying back to her room to make a quick change for dinner (at the Captain's table of course.) For this moment she had been planning on a simple shiny Monsoon bridesmaid-esque frock with matching beaded bolero. More than a little tipsy she stumbles over to the wardrobe and yanks out a heavy black garment bag. She pauses. This was meant to be for her Bajan-beach wedding, to toyboy number 4... Sod it. With pillarbox red acrylics she tears the bag open to reveal layers and layers of chiffon in red and black and champagne. Alexander McQueen is taking her to dinner. With a dusting of glitter powder on her tanned cleavage, she's ready to wow. When she enters the ballroom the sound of cutlery stops dead and you could hear a pin drop. When the ship docks and its cargo unloaded for a stopover in Barbados, like a true glamour puss Jane takes the opportunity not to grease up and lie on the beach, but to hit Barbados' many jewellery shops. Decked out in head to toe Miu Miu, in a palate of greens; she feels the only thing missing is oodles of emeralds. Out come the credit cards, and Jane thinks to herself 'yes I better sign on for another season of Loose Women.' In the evening rum punch on the beach is paired with a sprightly Balenciaga baby blue skirt suit. The locals are entranced with Jane's dulcet tones and after whipping off the suit to reveal another cheeky Balenciaga number (a loudly printed matching top and culottes: Jane is queen of the quick change) she delights all with a surprising performance of Ace of Base's 'The Sign,' backed with twelve steel drums and the gentle creaking of the crickets.